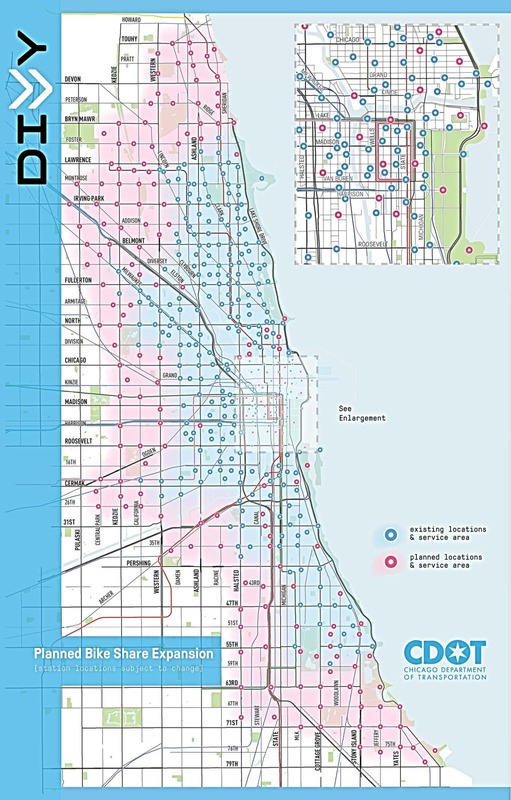 The new Divvy expansion map with new coverage areas in pink. View a larger version. In mid-July, Alta Bicycle Share’s Mia Birk told Marketplace that, due to pipeline issues, new bikes for the systems Alta runs probably wouldn’t arrive until 2015. At the time, I predicted that the Chicago Department of Transportation would soon announce that it wouldn’t be able to expand the Divvy system from 3,000 to 4,750 cycles this year, as previously planned. More than a month later, CDOT finally announced yesterday that Chicago won’t be getting new stations until early next spring, but they cleverly softened the blow by releasing the locations for the 175 docking stations that will be added to the existing 300. Roughly 3,100 additional docks will be added, according to Divvy general manager Elliot Greenberger. In the news release, CDOT also boasted that, with 475 stations spread over 87 square miles and 31 wards, Divvy will have the largest number of stations and the widest coverage area of any North American city. However, New York’s Citi Bike system will still have far more bikes, with 6,000. Chicago’s new map of planned stations was influenced by hundreds of suggestions residents made via a station request website. The new coverage area will stretch almost to 79th Street on the South Side, as far as Touhy Avenue on the North Side, and a bit west of Pulaski Road. Infill stations will also be added downtown, and on the Near South Side, the North North Side, and in Hyde Park. In order to ensure the system would be financially viable, CDOT officials said the first round of 300 stations was concentrated in areas with a high density of transit stops, retail, employment nodes, and other destinations. Although low-income communities like Little Village, Pilsen, Bronzeville, and Oakland did get stations, some commenters and residents argued that the system was overly focused on affluent parts of town, and that too many poor neighborhoods were overlooked. The expansion will bring many new communities, of various income levels, into the coverage area. Some of the new neighborhoods that will be served include South Shore, Englewood, McKinley Park, Lawndale, East Garfield Park, Irving Park, Avondale, Edgewater, and Rogers Park. Although the city still hasn’t solved the problem of providing bike-share access for people who don’t have credit cards, the expansion will encourage tens of thousands of new people to use Divvy. One drawback of the broad new coverage area is that the new districts will have a low density of stations. In most parts of the city that currently have Divvy, the stations are spaced about a quarter-mile apart, but in the new areas the stations will generally be located a half mile away from each other. That means that users may have to walk a greater distance to check out a bike, and to get from a station to their destination. And, when there are few stations near a particular destination, an empty or full station can be a real pain in the neck. This increases the importance of rebalancing, which means more driving for Divvy staffers. I experienced downside of sparsely spaced stations firsthand earlier this week when I rode a Divvy bike to meet a friend at Montrose Beach. The beach’s sole bike-share station was at capacity so, after waiting 15 minutes for someone else to check out a bike, I gave up and pedaled almost a mile to the nearest station at Marine Drive and Junior Terrace. Needless to say, I didn’t reach the beach until long after I was supposed to get there. Hopefully, CDOT will eventually install infill stations in the new coverage areas. That will make the network more useful and cut down on the need for rebalancing. If you look at the data from the lower density areas, hardly anyone is checking out a bike. All in a all, a waste of money to expand to low density residential areas. It does look like more than a few of the stations in the expansion area are just at street intersections… I wonder if they’re also along routes that people normally bike. Finally something I agree with you on! I was disappointed to see the expansion map not including filling in stations. I’ve experienced docks full one too many times- and was hoping the expansion would add stations. I won’t be renewing since it will only get worse. I can only hope they go bankrupt first! The one closest to me is at Lunt and Western. There is some bike traffic there, although both those streets are horrendous for biking for different reasons. A few factors that might enter in: there are several good local restaurants clustered around that corner and a very fine and newly renovated park, and it’s at the intersection of the more-or-less-adequate 49B and sub-minimal 96 bus lines. I’m hoping Divvy might serve as a partial fill-in for the east-west transit that barely exists in our neighborhood. I agree I would have liked to see more in-fill, especially in the Loop, although the valet service this summer has been great. I understand the desire to expand the coverage area though. While station density can help with the problem of arriving at a full station, so can increasing the number of docks at a station. The real benefit of greater station density, from my point of view, is increased convenience to destinations. According to this article (http://bikeshare.com/2013/05/size-matters-but-so-does-density/), New York has a density of 26.4 stations per square mile. Divvy’s expansion will put Chicago at 5.5 stations per square mile. Sure, it would be great if all of the newly-served ares had stations less than half a mile apart. But it’s a lot better than nothing, or being over a mile away from a station, like most of those areas are now. As John notes, hopefully another future expansion will increase the density of stations in the newly-served areas, as well as expanding even further out. For me, the expansion next Spring will mean there will be six stations within a half mile of my house (the HUB Co-op at 24th and Marshall Boulevards), instead of just one now. I can’t wait! “Low density residential areas?” Like Little Village? Are you joking? A good pun and a fine restaurant! Begging pardon for the shameless promotions, but I love this neighborhood! Increasing the number of docks at a station can make a big impact on whether a station is full when you want to end your trip. The ITDP bike-share guide that I’ve quoted earlier recommends at least 2.0 docks per bike. NYC and Paris have ~2.4 docks per bike and when I checked on July 30, 2014, Chicago’s Divvy had 5,209 docks for approximately 3,000 bikes (the real-time station data can’t tell you how many bikes are out there). That’s 1.7 docks per bike, significantly below the recommended ratio. Divvy has increased the number of docks at a station a few times, most noticeably at the two Union Stations within the past few weeks, and at Daley Center/Plaza. I live in a denser area and the two nearest Divvy stations are 3/4 mile away. With the expansion I’ll have one 1/4 mile away (at Belmont/Fletcher, 100 feet from Belmont/California/Elston). You can say that again! By far my worst Divvy experience was taking a bike from Palmer Sq to Logan Sq, finding a full dock, and going .75 mi. back to Palmer Sq. to dock our bikes. Now I make sure there are a least a few empty docks at my destination if I’m headed to an edge point. I’m disappointed that the expansion doesn’t do anything to remedy that specific area, but overall, it’s nice to see Logan Square get into the mix. I’m also a little surprised the coverage didn’t expand westward along the Bloomingdale past Albany, as it seems like there will be a lot of demand along the length of the Bloomingdale. Divvy stations form a network. Edge nodes will always see less activity than inner nodes. That’s just how networks work. Here’s a quantifiable prediction: the current edge stations will see increased usage as the coverage area expands beyond them. Try using the RideScout app. They were supposed to add “prevent dock blocking” as a feature. Typical chicago way- great ideas, but poor execution. I predict divvy will be bankrupt by next spring anyway, so it doesn’t really matter. If Divvy is useful mainly when the origin and destination are both within a block or so of a station, then its usefulness increases quadratically, not linearly, with local station density. Divvy is not that useful to me right now within Hyde Park, except marginally for going to the Point, but it will be once the expansion stations come — for getting to the Green Line, the Logan Center, and other spots just outside easy walk range. I’m afraid that low station density will lead to low enough ridership that the expansion is judged a “failure” — though I don’t think much shouting has been had about low ridership in low-station-density areas such as Bronzeville or Bridgeport. I’m excited to be getting a station pretty much across the street from where I live in South Shore. It’ll finally be feasible for me to dock-surf all the way home in the middle of the night if I have to. Never taking a cab again! But as excited as I am about the expansion, I would like to see more infill in the Loop, particularly. I am also having the opposite problem that most people are experiencing with full docks. The eastern part of the Loop is often critically low on cycles; more are needed. The other day I was going from Michigan/Jackson to the Jewel on Roosevelt and Wabash. The two nearest stations ran out of bikes and I ended up walking all the way to 8th and Wabash before I could grab a bike (at a station with only 3 available). The chronic trouble getting bikes in the afternoon in the east Loop is pretty annoying. My first reaction to Divvy having more stations but fewer bikes than NYC was “yay, that’s a good thing, since it reduces the chances of running into a full station!” But since it’s really docks-per-bike that’s the determinant for running into a full station, not stations-per-bike, the truth is apparently the opposite of my first impression. That ~2.4 docks-per-bike in NYC apparently means their stations contain significantly more docks per station than Divvy. It looks like the existing docks-per-station average in Chicago is about 17 (5209 / 300 = 17.4), and it looks like the expansion will maintain that ratio (3100 / 175 = 17.7), so we won’t get any help there. But maybe they won’t increase the number of bikes in proportion with the number of new docks? Nope, no luck there either, as the expansion continues with exactly the same 1.7 docks per bike ratio (1750 bikes / 175 stations = 10 bikes-per-station, and 17 docks-per-station / 10 bikes-per-station = 1.7 docks-per-bike). So either Divvy has clearly decided that 1.7 docks-per-bike is the right number for them and better than the recommended 2.0, or the numbers being given related to the expansion are just an off-the-cuff extrapolation of the existing ratios that will change once the rubber meets the road. I’m sort of hoping it’s the latter, since it seems like whether the current ratios are optimal or not, the optimal ratios for the expansion would at least be *different*, given the decrease in station density. I’ve had similar issues at times when looking for a bike at some South Loop stations in late afternoon or evening. I’ve often used Lunt as a bike route and I don’t consider it horrendous. Having Divvy as a transit supplement in that location is a very good thing. I agree with you about the crappiness of current bus service there. It was interesting to come from Bronzeville/Kenwood/whatever and to Edgewater where there are few stations and even fewer bikes. I’m looking forward to more bikes in Edgewater and more bikes in general. I will defer to your estimation of Lunt, since it is based on much more experience. It seemed like a narrow squeeze to me, with some pretty bad pavement between Western and Ridge, but that could just be my geezerhood showing. I did see a few people biking to the Metra stop nearly every day when that was my commute to work. Divvy said it will expand by 175 stations, 1,750 bikes, and approximately 3,100 docks. So I think your assessment is correct. When I’ve ridden it, it’s usually been on the weekends when traffic was relatively light except right around major cross streets. I know folks use it to get to/from Metra for their commutes. Yeah, pavement needs some TLC betw Western and Ridge. The addition of a station at the Garfield Red Line stop will make a big difference for my late-night travel to Hyde Park. The western edge of the Loop also gets wiped out in the evenings. I often end up walking to the train stations, where they typically pile up. I would like to have seen more in-fill in the Loop too, but part of the calculus may have been political. Not sure why you would say that given that it essentially broke even the first year and now boast a membership based of over 20,000 riders. Reminds me of the time a friend complained how awful the first orchestra practice of the year always was. I told him the solution was to skip having it. And one more, across the street: Mike’s Place! Would it be feasible to add more docks to the popular stations the tend to fill up? The docks look like the come in sections of 4 docks per section. Seems like these would cost a lot less than adding entire stations. What’s Up With Evanston’s Unusual Divvy Station Location Pattern?